Design your own custom party printables with this easy-to-use flagpennant banner template. You can create custom party decor for a boy or girl's birthday party, baby show, bridal shower, wedding, or other occasion. Print the template as many times as you like to create a party banner as long as you want. The finished size of each flag is is 5" by 7". This is a digital product and no physical product will be sent. 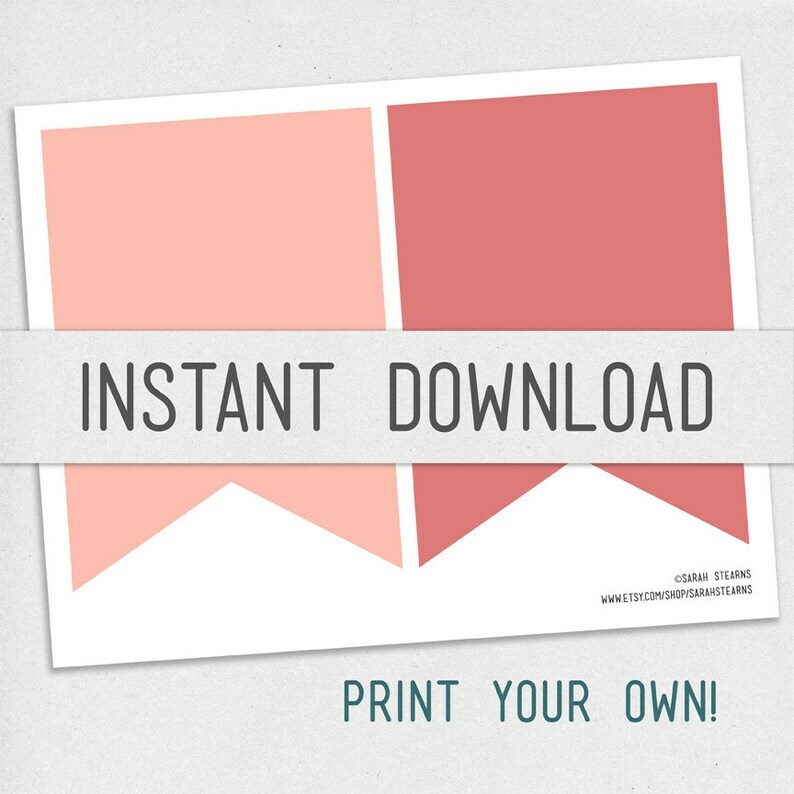 After completing checkout, you’ll be shown a direct link to the Downloads page for your order. From here, you can download all the files associated with your purchase. We’ll also send you a download notification email after completing checkout. This email will arrive separately from any transaction notification emails you received from Etsy and/or PayPal. To access your digital file(s) at any time from within your account, visit your Purchases page and look for the order. There is no limit to the number of times a file may be downloaded. By purchasing a Sarah Stearns product you are purchasing a license to use these products for PERSONAL and LIMITED COMMERCIAL use. These products are intended for personal use projects. You may use these graphics to create customized products (storyboards, layouts, albums) for your clients. You may not use these graphics to create digital designs of web templates for resale. All digital images and sample images are Copyright ©Sarah Stearns, all rights reserved. Thanks so much! I love these--makes things so much easier. Simply beautiful! Easy and fast to download. Payments can be made with Etsy Direct Checkout using your credit card or with PayPal using your PayPal account or Credit Card. Due the digital nature of my products, returns are not generally accepted. If you have questions about this policy, please contact me. By purchasing a Daydrifter Digital product you are purchasing a license to use these products for PERSONAL and LIMITED COMMERCIAL use under the terms outlined below. If you are unsure of a certain way you want to use my designs, please contact me with your project details. You CAN use and incorporate these products in all personal projects. You CAN print a hard copy of these products to be used in your personal projects. You CAN use these products as graphics on your personal website and/or blog. Credit is not required but it would be extremely appreciated. You CAN use these products to create customized PRINTED products (party decor, invitation, card, etc.) for your customers. You CAN use these products to create customized DIGITAL products (party decor invitation, card, etc.) ONLY if personalization for each individual customer is added and the product is flattened in .JPG format or Print Only .PDF format. You CANNOT re-distribute/share/sell these products, or any portions thereof, as they are received. You CANNOT claim any of these products as your own. You CANNOT re-distribute/share/sell any of these products for anything other than your customers' own PERSONAL USE. You CANNOT re-distribute/share/sell any of these products in any way on print-on-demand sites such as Snapfish, Cafe Press, Zazzle, or Spoonflower. If you have questions about the use of these products, or would like to purchase an EXTENDED COMMERCIAL use license, please contact me.